Wrack is a cel-shaded FPS from indie developer Final Boss Entertainment. The game is an arcade style shooter that the developers say takes influence from Doom, Contra, and Mega Man, which instantly caught my attention. Wrack is currently on Steam Early Access for $14.99, but the developers have given us three 25% off discount coupons for those of you who want the opportunity to try the game out for yourself. 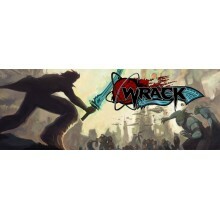 Leave us a comment on this post saying that you want to try out Wrack, or post to our Facebook or Twitter . One week from today, on Sunday, August 30th we will choose three people that have entered and you will contacted to receive the 25% off discount coupon! Arcade-style Action – Battle against hordes of monsters at blistering speeds, all while racking up addicting kill chains and combos! Thanks to Wrack‘s arcade-style checkpoint system, death means you’re only a few seconds away from getting back into the action! To top it all off, battle Contra-style bosses in huge arenas! Custom Content – Play showcased maps through Wrack itself with the Featured Maps system! You can also develop and share your own content using our modding tools, including Wrack‘s level editor, WrackEd! For more information on modding, check out the wiki! Gameplay Modes – Compete against yourself, your friends, and the world in Wrack‘s Time Attack and Score Attack modes! Test your reflexes by racing through maps as quickly as you possibly can, or test your mind by racking up as many points as you can! Leaderboards – Marvel at the record-setting Time Attack/Score Attack entries by watching the replays! Not only do Wrack‘s leaderboards store everyone’s best Time Attack/Score Attack attempt, but their replay as well! Want to know how someone got an insanely good time? Check out the replay! Storyboards and Cutscenes – Immerse yourself in the Wrack universe! With character design and storyboard artwork by Jack Love, we’re creating a rich cast of characters with tons of lore. Play as Kain Sager as he attempts to save mankind from a deadly alien invasion, and find redemption. We’d like to thank Final Boss Entertainment for giving us this opportunity, and will have a hands-on preview of Wrack in the near future.